As you may have heard recently, hay prices have been going up due to high temperatures this year, making it increasingly harder to feed and maintain horses. In a recent article by WTRF.com, it is estimated that it can cost as much as $1,000 to keep a horse fed: a price many Columbus, Ohio residents are finding they cannot afford. The more classic look. 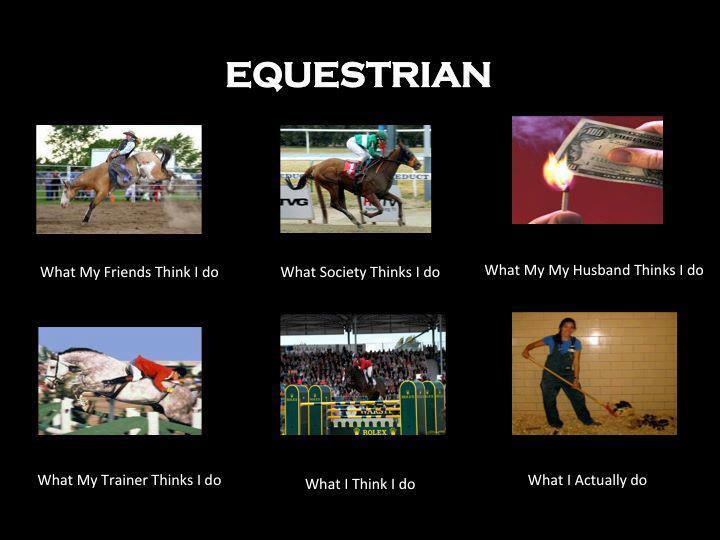 Image courtesy of Equine Now. As the sport of riding has evolved, so has its apparel. Once, riders wore helmets that were thin and offered little protection. At another time, they added clear plastic or elastic head straps to keep the helmets on their heads. Now, technology has enabled more advanced equipment that offers more protection and comfort. However, as these classics have evolved, are we losing some of the formal notes that made the sport so dignified? Oh, now those are a tad bit loud. The hi-tech knee…ribbons…don’t really help..Image courtesy of Horse Zone. In an article in the Wall Street Journal’s Washington Wire, it was released that a recent ad featuring Rafalca was pulled from the air. The ad, which featured criticising remarks about Romney’s tax return statements also showed footage of Rafalca competing in dressage events. It’s no secret that horseback riding is an impressively expensive sport, but in a statement by President Barack Obama, it was mentioned that he considered the ad was in bad taste and said he was against personal attacks on family members. In an interview with Good Morning America, Mrs. Romney’s hurt reaction caused concern that the ad hit too close to home: Mrs. Romney uses dressage to combat her multiple sclerosis and has spoken about its benefits in public before. 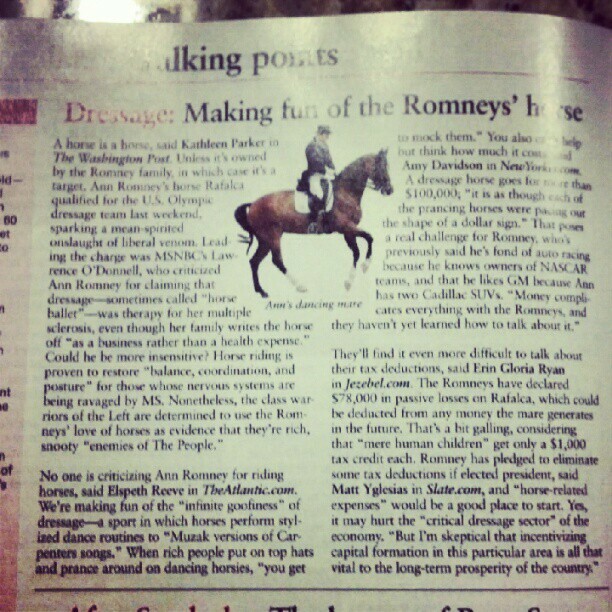 Have we had the last laugh about the Romneys? Ann Romney and Rafalca, who will be competing in the London 2012 Olympics. Image courtesy of The New Yorker. UPDATE: Rita Crundwell has pleaded ‘not guilty’ to the fraud charge against her. In the quiet town of Dixon, Illinois, long-time comptroller Rita Crundwell is alleged to have embezzled over $30 million to fund a private horse farm, a lavish motor home, and expensive jewelry. The horse farm in question, Meri-J Farm is well-known for its high-quality quarter horses that were predominantly local champions in the western riding scene. 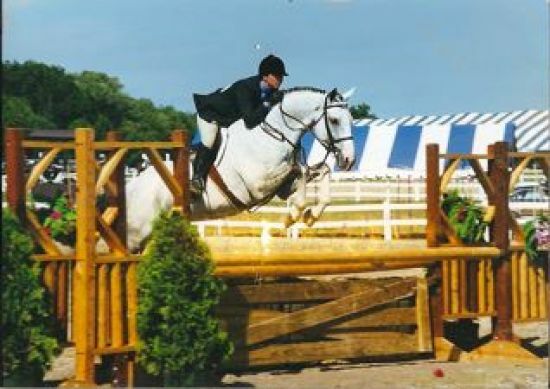 Crundwell was well-known for her elite horses, most recently praised for her mare ‘Pizzazzy Lady’, who won the 2011 American Quarter Horse Association World Championship Show in Oklahoma City. Pictured: Rita Crundwell and one of her horses. Image courtesy of The Atlantic. The Cowtown/Work to Ride team, which has been active at Chamounix Equestrian Center since 1994, is notable for being comprised of mostly black players. In a sport so dominated by mostly white teams, it is refreshing to see a diverse program successfully establish itself. When the team won the National Interscholastic Championship in 2011 against Baltimore, every member of the team was African-American, making interscholastic history as the first-ever all-black team to win.